One Republic has an amazing song called “I lived”. Not only are the words inspiring but the song is dedicated to one of their fans, Bryan Warnecke who battles with Cystic Fibrosis. Yet, he does it all and lives for every moment. So who are we to live our lives always fearing the future? In my opinion, there is no difference between a physical illness and a mental illness. If somebody with a physical illness can say that they “owned every second”, we should be able to do that too. Do not allow Depression, Stress, Anxiety, Bipolar Mood Disorder or any other diagnosis to be in control of you. It may be your illness but it should not be the manager of your life. We spend so many moments waiting to get better or waiting for life to be better rather than making the most of that precious moment that we are living. Be awesome, live with courage, have faith, embrace life so that you too can say, “I did it all”! This week’s blog is dedicated to my friend, mentor and inspiration David who really does it all despite everything. I have been treating a lady for the past few weeks who was raped and is constantly beating herself up about why she chose to walk through the area that she did when it happened. She keeps on saying that she wishes that she had decided to walk somewhere else that day. But she didn’t and unfortunately she had a horrific and traumatic experience. Unfortunately it is too late! Yes, it is too late to change what you did. But the thing is that if you did something ‘stupid’ or even something not so stupid that still had negative consequences, unless you know how to tell the future (and I sincerely doubt that you can), you had no idea what would happen as a result. You most likely did the best that you could at the time. It is easy to look back with hindsight and berate yourself. As far as I know, nobody ever ‘fixed’ the past by beating themselves up about it. It is what it is, it was what it was. You can go a long way by forgiving yourself for doing things that you did not know or understand at the time. 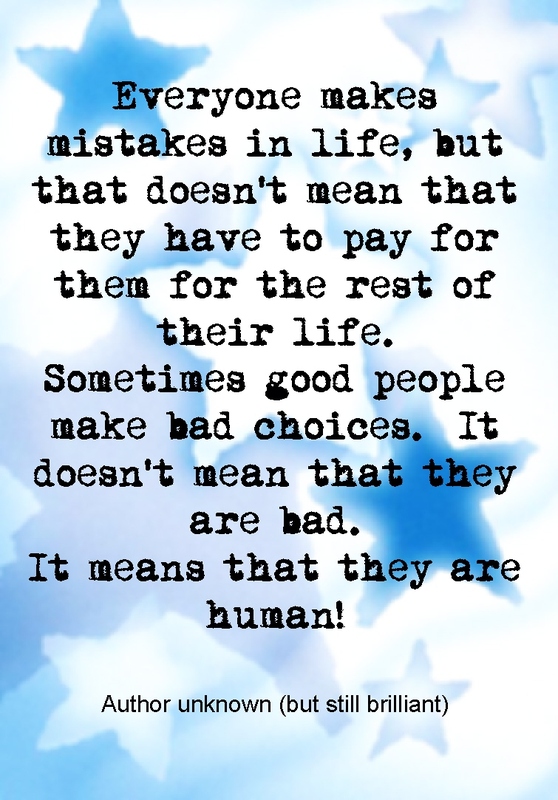 You are human, you are wonderful and therefore you make mistakes. Try your best to let it go. Try to be more gentle on yourself. You are allowed to ‘erase’ the past and move on. Even better, you are allowed to redraw your life story, building on what you learned from your mistakes – and this version may be even more awesome than the one that you set out to write in the first place.